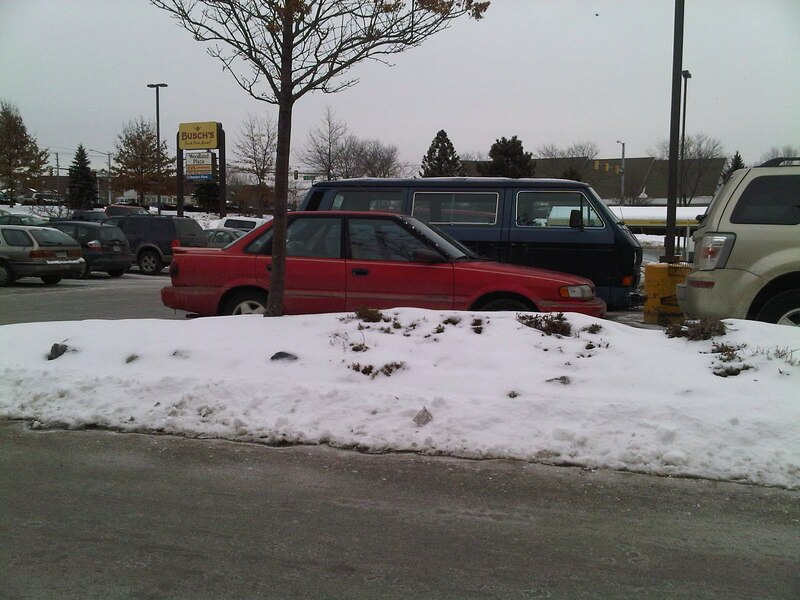 While driving home from the airport this afternoon, I spotted this - the Holy Grail of Geos - the 1991 Prizm GSi. I caught up and followed it into a parking lot to get these low-grade images. What makes a GSi so special? Why not settle for the LSi? 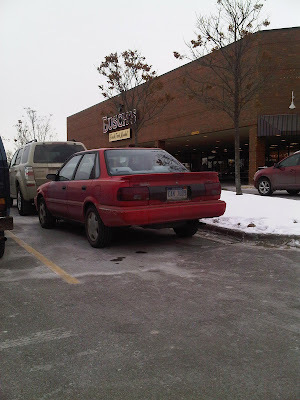 Well, the GSi was sporting man's Geo. It had the trusty and potent Toyota 4A-GE twin cam motor with 10.3:1 compression, a 7800RPM fuel cut, and 130hp. It also had the C56 close ratio 5-speed box with 4.56:1 final drive. As with nearly any car with the 's' suffix in the late 80's and early 90's, it got lower and stiffer springs compared to its lamer counterparts. However, rear subframe connectors, stock strut tower brace, thick front and rear sway bars, and 4-wheel disk brakes really completed the package. Beyond the mechanicals, these cars had nicely bolstered seats, a three-spoke aluminum and orange stitched leather rimmed steering wheel, and substantially more dials to look at on the gauge cluster. They also had a really tasteful rear spoiler and body accessories. This was the the best Geo ever built and one of the best things to come out of NUMMI, in my humble and 4A-GE biased opinion. I stumbled onto one of these with 50k on it, 12 years ago. Bought it for my daughter and she promptly blew it up. It was in the garage for 10 years. A couple years back I decided to repower and sell it. Drove it home from the shop on backroads and that was it. I gave my 4yo auto-TA Elantra to my son and use the GSi as my commuter now. 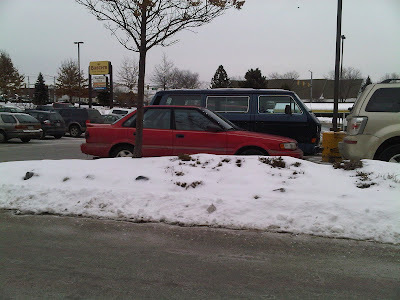 The 5spd GSi has a newer remanufactured engine with induction/exhaust upgrades and KYB/Eibachs. It's a freaking blast to drive, screams to 7,800rpm, gets 30+mpg and its unique. My wife won't ride in a "Geo anything" (regardless of how cool I think it is) and my old-guy friends just shake their heads. You can't beat the GSi and the Nova TwinCam. I had one of these motors in the older body style (ae82) four dour sedan. Went like stink and got 36 MPG Hwy.